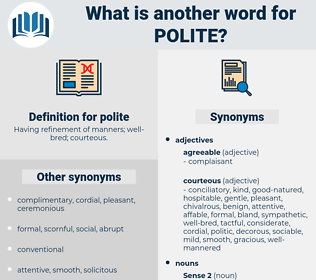 What is another word for polite? Having refinement of manners; well- bred; courteous. rude, friendly, delicate, nice, sensitive, cultured, educated, pleasant, decent, gentle, amiable, sweet, thoughtful, neighborly. 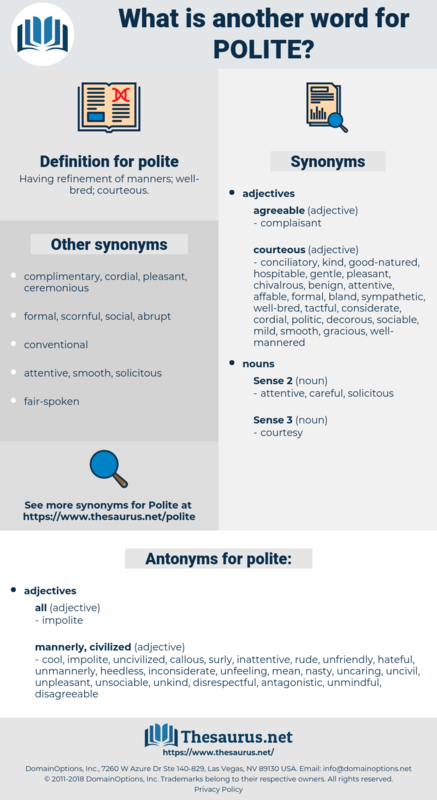 unsophisticated, disrespectful, rough, discourteous, unfriendly, inconsiderate, rude, unkind, disagreeable, hateful, antagonistic, uncivil, mean, callous, unmannerly, aloof, uncaring, heedless, uncivilized, thoughtless, unfeeling, inattentive, cold, unrefined, nasty, unpleasant, unmindful, surly, unsociable, cool. shabby, arrogant, unrespectable, untutored, shameless, indecorous, incorrect, presumptuous, improper, prohibited, Clodhopping, informal, unbecoming, awkward, outlawed, gauche, forbidden, Interdicted, vulgar, ungraceful, pretentious, intolerable, untaught, seedy, indelicate, unpolished, inappropriate, ill-behaved, lippy, barred, grungy, banned, casual, blunt, unacceptable, unseemly, raw, proscribed, bluff, unsatisfactory, tacky, insulting, conceited, brusk, rustic. Father Benwell, from head to foot, expressed modest confusion, and polite anxiety to hide it. Or - or was he just being polite?"